Jody Scheckter's victory in Belgium had moved the South African to the top of the standings in the World Championship with 25 points but he was only a point clear of Jacques Laffite with Lotus's Carlos Reutemann (21) and Gilles Villeneuve and Patrick Depailler (20 apiece). The title was wide open. With only 20 starters at Monaco there was a pre-qualifying session for Jochen Mass (Arrows), Hans Stuck (ATS) and Gianfranco Brancatelli (who was standing in for Merzario as he was injured and the Kauhsen team had given up). With Rebaque failing to appear and Alfa Romeo staying at home only one man needed to be weeded out and the Merzario was not a match for the Arrows and the ATS and so Brancatelli went home early. Ferrari seemed to be developing faster than Ligier and the front row featured Jody Scheckter and Gilles Villeneuve in the red cars. Patrick Depailler was third in his Ligier but Niki Lauda (Brabham) was slightly fastest that Jacques Laffite (Ligier) and so took fourth place. Jean-Pierre Jarier (Tyrrell) was sixth fastest with his team mate Didier Pironi matching his time, while Mass was an impressive eighth ahead of Alan Jones (Williams) and James Hunt (Wolf). The two Lotuses were off the pace with Mario Andretti (in the Lotus 80) in 13th and Carlos Reutemann (in an old 79) 11th. McLaren had a new version of the M28 for John Watson and he qualified 14th but Patrick Tambay failed to make it in the earlier version of the car. At the start Scheckter took the lead with Lauda getting ahead of Villeneuve and Depailler in the run to Ste Devote. Laffite was fifth with Pironi sixth and Jones seventh. On the third lap Villeneuve was able to get ahead of Lauda and set off in pursuit of Scheckter. For the next few laps it was quiet as Villeneuve closed the gap to the leader while Lauda ran third under pressure from Depailler, Laffite, Pironi, Jones and the rest. On lap 16 Pironi ran into the back of Laffite, which forced the Ligier driver into pits. Three laps later Pironi punted Depailler out of the way at the Loews Hairpin. On lap 22 Pironi tried to pass Lauda and the two collided and retired. This left Jones in third place but he survived only until lap 43 when he retired having damaged his steering. As fourth placed Jarier had disappeared with a transmission problem a little earlier Mass found himself third but he was in gearbox trouble and dropped behind Clay Regazzoni's Williams. On lap 54 Villeneuve's race ended with transmission failure and so Scheckter seemed to have everything under control. But in the closing laps Regazzoni closed in dramatically (despite a gearbox problem). At the same time Depailler was closing on Reutemann for third. 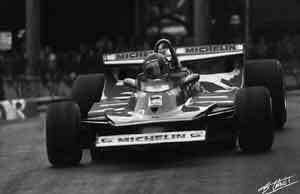 The last lap provided an exciting battle but Scheckter got to the line first, four-tenths ahead of Regazzoni. Reutemann was third because Depailler's engine had blown and so fourth went to Watson with Depailler classified fifth and Mass sixth, although he was seven laps behind.